Imagine if you have difficulties highlighting and were told to highlight the line followed by typing the answer. Wouldn’t this frustrate you if the teacher moved on and you were still typing the answer? Highlighting is a skill which even slows down the experienced adult user when typing and editing a document. What if the answer was long and changed the format of the worksheet? When you looked up at the interactive whiteboard to copy down the next bit of information everything looks different! If the worksheets were setup differently this could prevent undue challenges while typing traditional notes and answers into a worksheet. When using a Google Doc Type the questions and place a single cell table for the answer. 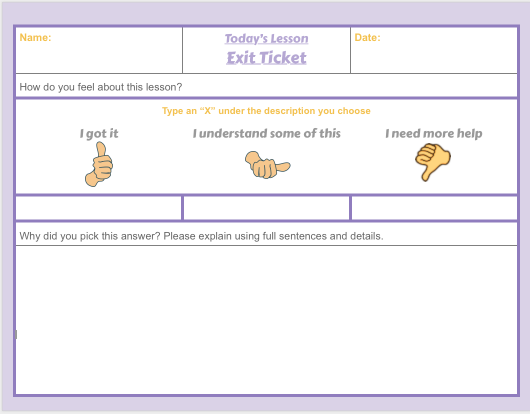 This will provide the student with a clickable area to type the answer. If you color fill the cell this would make it even easier for the student to find where they left off. Google Slides offers a magical tool called, “View Master” this allows you to customize layouts by locking down graphics and text. When using this tool it lessens the chances of students deleting worksheet information while typing. This is because the words and images you edit in “View Master” are locked into the background of the slides template.